An SI 60 Q&A with William Nack on his famous 1990 Sports Illustrated story, "Pure Heart," a personal reminiscence on the life and death of the great racehorse Secretariat. In 1971, William Nack was an environmental writer at Newsday, the Long Island newspaper. At a particularly festive office Christmas party that year, Nack stood on a table and recited the name of every Kentucky Derby winner, a list that stretched back to 1875. The paper’s sports editor was so impressed that Nack was soon asked to be a horse racing writer. The following June, he went to Belmont Park to visit Riva Ridge, that year’s Kentucky Derby winner, and was pulled aside by exercise rider Jimmy Gaffney, who suggested Nack meet Ridge’s stablemate. “You wanna see the best-lookin’ 2-year-old you’ve ever seen?” he asked. Thus was Nack introduced to Secretariat. With his instincts as a reporter supplementing his love of horse racing that stretched back to his childhood in Illinois, Nack had quickly sensed Secretariat’s potential and decided to write what he hoped would be a magazine story about him. Instead, after Secretariat was named Horse of the Year in 1972 and followed it up in ’73 by becoming the first horse in 25 years to win the Triple Crown, it became a book, Big Red of Meadow Stable: Secretariat, the Making of a Champion. Having shown that his talent in writing about horse racing was as deep as his knowledge of the sport, Nack’s career soon took off like a thoroughbred tearing down the homestretch. He was promoted to columnist in 1975, wrote his first piece for Sports Illustrated in 1978 and by ’79 was hired at the magazine, where he quickly became one of the SI’s most distinctive and versatile writers. Not long after Secretariat had to be put down in 1989 because of laminitis, a hoof disease, Nack was reluctantly coaxed into writing about him one last time. The result was “Pure Heart,” which ran in the June 4, 1990 issue of SI and remains a beloved story. SI: How did this piece come about? NACK: I happened to be down in Kentucky in October of 1989 -- I was never there in October of any year -- but I had to go down there because I was working on a story about a rivalry between two brothers, Arthur Hancock, who had been run off Claiborne Farm, and his younger brother Seth, who had inherited the farm, which was the biggest commercial breeding farm in the world. That story became “Blood Brothers And Bluegrass.” While I was down there I happened to visit Claiborne. I went up to see Lawrence Robinson, who had been the head caretaker of stallions there, and while I was waiting for him, I looked down and I saw Secretariat standing and grazing with Bobby Anderson, a groom who was holding him while sitting on a bucket. I remember wondering, What’s he doing down there, why he isn’t in his stall? It was very unusual. He looked a little thinner but he looked good. I remember thinking, Maybe I should go down there, but I thought, No, I better go around to the office. I got in my car and drove around to the office and when I walked in there were secretaries crying at their desks. I thought, What the heck happened? I shouldn’t have even asked him. I should have just walked out there and gone to see him on my own because I would have had a last chance to put my hands on him. But I didn’t. I saw Annette Covault, an old friend who worked there, and I said, “Do you think we’re going to lose him?” She said, “Yeah, I think so. I’ll call you the minute I know anything.” About noon or 1 pm the next day I got a call in my hotel room from Annette saying they’d put him down. SI: The emotion you describe at the end of the story is very raw. Why did you want to be that honest about it? NACK: It was a very truthful rendition of what happened. I can still remember leaning against that hotel room wall and sobbing. That horse had meant a lot to me and my family. I used to bring my four kids out to see him. He was like a part of the family. That book had been the first I ever wrote, and that horse had represented a part of my life with my wife and children that was very happy. I was a very contented person at that time. We were divorced by [the time of the story] and his death seemed to close a curtain on my life. He represented more than just being a horse, he represented something that was going on in my own life, having kids running around the house and being happily married. SI: Did you want to write about it? I said, “What story?” I knew just what he was taking about. He said, “OK, sounds great. The one thing I don’t want you to do is, I don’t want you to mention your book.” I think he was projecting because he had written a book about Jack Nicklaus and he’d have mentioned his book in similar circumstances. I wasn’t going to do it anyway. There wasn’t going to be any book in it. I didn’t even think of that. I think I got down to the Derby on Monday and they wanted it by Thursday or Friday. I fiddled around on Tuesday and I had brought some clips to remind me of things and I was sitting there in the hotel room at he Galt House and I thought, You know, I’m going to start this story when I went to Lawrence Robinson’s house and I saw him on the field being held by Bobby Anderson and then I can reminisce about his life from the hillside. The whole piece will be a flashback and then I can end the story when I go into the office. And so I constructed it in my head and was satisfied with the general outline of it. So Bauer called me up either that day or the next day, and he said, “I want you to write 200 words for me about them leading the horse out of the stall and how they injected him with this barbiturate and put him down. Describe that whole scene to me in 200 words without mentioning the horse’s name. Never mind why. Call me when you’re done and dictate it to me.” It was very easy to do, took me five or 10 minutes: "They led the horse haltingly out of the stall…"
I couldn’t imagine it. I was very skeptical but it was an excellent judgment call by David. Peter’s judgment call that it was finished and that I stop writing and go to bed was excellent advice too, and Bauer’s suggestion to encapsulate the death of the horse was also great advice. That was a great bit of editing. It was enormously helpful. And it really kind of bookended the story without screwing up the ending. SI: You mentioned the positive reaction to the story in the office. What was it like outside the office? NACK: Just astonishing. Guys I’d never heard from [told me they loved it]. Mulvoy said they had 400 some odd letters. He said, “I’ve never read letters like this.” People were weepy. A lot of hit had to do with the fact that the horse was iconic, and it was a sad ending. It wasn’t like he laid down in his stall and died of old age. They had to put him down. SI: It was a very honest story. NACK: It was about as honest as anything I’ve ever written. When I got to the end I knew I could write what I wrote because of all I had written before that. The previous 6,000 words made it clear that I was close to the horse. I even said in the piece that he was part of the family. I got real personal, I mentioned our shaggy, epileptic dog Muffin and that’s a real story too – we had a shaggy, epileptic dog named Muffin. No one loved this story more than my kids did because they lived it. SI: How do you like the story now? NACK: I’m most proud of that story than any I’ve ever written. It’s really held up over the years. I mentioned it to Arthur Miller, the playwright, once. I was sitting next to him at a dinner – he had gotten an award for something and I did too – and I said I wrote about Secretariat when he died and it was very difficult. I said, “I’ll send it to you if you’d like to see it.” So I did, and he sent this sweet letter back to me saying what an affecting story it was. He was very complimentary of it. He understood it, he liked horses and he liked animals. He was a very sensitive man and he understood human emotions on multiple levels. SI: What did Callahan and Mulvoy think? 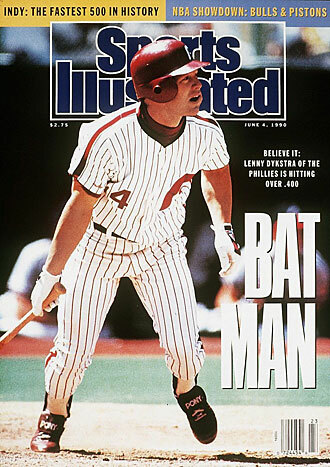 Lenny Dykstra was hitting .418 on June 4, 1990, the date he landed SI's cover, but he started dropping immediately, finishing at .325. I told Mark he should have put it on the cover. He had some stupid baseball player instead. NACK: Give me a break, Lenny Dykstra? Is he in jail? [Editor’s note: Dykstra was released from prison in 2013 after serving 6½ months for multiple charges, including bankruptcy fraud.] That was classic SI thinking. He really should have put Secretariat on the cover. People would have glommed on it. The cover would have commanded more attention to the piece. I’ve teased him about it before. I said, “You were a good editor but you blew the cover on the Secretariat story.” Can you imagine the horse on the cover, the death of Secretariat? SI: And you were there from the beginning with Secretariat, which is amazing, even though you had just become a horse racing writer a few months before. NACK: You talk about luck. Not only did I come on at the right time, but the right horse won the Derby in 1972 that drew me into the barn? You’re telling me there’s not design there? I’d been waiting all my life for another Man O’ War or another Citation. Call it what you want blind luck, fate, destiny -- who knows. SI: You had mentioned in the story that while you were reporting it you hoped it would be a magazine story. Were you thinking of Sports Illustrated for that? NACK: I was, and if they didn’t like it I thought maybe Esquire would do it. They were into in-depth things and did occasional sports stories. I didn’t know who else to go to. I had big plans that I was going to be a magazine writer. The Secretariat experience showed people I could write a little bit and so Newsday made me a columnist. Had I not became a sports columnist I would not have come to SI. Being a columnist became my apprenticeship for being at SI. Then another very lucky thing happened. I was a columnist in the fall of 1978 and I wrote a bunch of columns during the World Series between the Yankees and Dodgers that attracted the attention of the SI editors because there was a newspaper strike going on in New York. So they started getting Newsday as their news source and they started reading my column. This is what I was told anyway. I had a good series. Might not have been as good as Reggie Jackson, but I had a good series. I said sure. I came in that November or December and talked to him for a little while and then he said, “We’ve already decided to hire you if you’d like to come.” I called up the next day and said, "I’ll do it." He said, “Congratulations. You’ll like your experience at Sports Illustrated.” Boy was that an understatement. For the vast majority of it, it was fabulous. In 1955 when I was starting to follow sports my parents bought me a subscription to SI. I had every 1956 edition of Sports Illustrated and I read them all cover to cover. I can still remember stories that ran in that magazine for the Olympics in '56 at Melbourne, particularly one about Vladimir Kuts and Gordon Pirie running against each other and I remember the cat and mouse game, according to the writer, that Kuts played with Pirie. [Editor’s Note: The story, headlined "Kuts The Cat, Pirie The Mouse,” was written for SI by Roger Bannister, the first man to run a sub-4-minute mile. It ran in the Dec. 3, 1956 issue.] It was so vivid. I can still see it now. What a great magazine this was. It was literate, it was well done. It had writers like Bill Leggett, Tex Maule, Gil Rogin, Whitney Tower. It was just great reading.